Bristol Bay is boats. Most people living in the Bay own at least one boat that floats, and all of the yards have vessels in various stages of disrepair parked alongside the garage. There are Lund skiffs, older wood skiffs, 32-foot wood drift boats that have fallen from favor and fiberglass boats that have been replaced by newer, bigger, better and faster. The price tag on working gillnetters can be as low as ten grand for an out-of-repair fiberglass Rawson or as much as $400,000 for a fancy new aluminum drift boat with full refrigeration. Setnet skiffs can be free for an old decrepit wood Seymour or can go as high as $40,000 for a designer aluminum model. In Bristol Bay, the vessel defines the fisherman. I first came to Bristol Bay to fish commercially when I was 21. I had four years of fishing behind me and was ready for my own operation. I arrived with a rebuilt 40-horsepower Johnson outboard over my shoulder. I had no nets nor a place to fish, but more importantly, no boat. My outboard motor and I caught a ride to Graveyard Point on the Kvichak River. There was an old skiff on the end of the dock that had spent the winter in the water. It was sunk and sawed almost in half by the rope that had kept it snug to the dock through the winter. The winterman at the mothballed Graveyard Cannery, whose name escapes me after all of these years, told me I could have it. I pulled it up dry, flipped it over and several days of intense labor brought the old Woody back to life. "Half-a-Boat" served me well for two seasons, after which I parked it in favor of a new aluminum model. That was in 1974 and she is still at the dock, well beyond any redemption, with just the bow plate poking from the tundra. The aluminum skiff still serves me. It has been up and down the Yukon River five times and spent a couple of years running around Prince William Sound. It has carried everything from polar bears to peregrine falcons. Well over a million pounds of salmon have crossed her gunwales. The majority of the wood skiffs that fished in Bristol Bay were Seymour skiffs, made in Seattle expressly for the Bay setnet fishery. Most were 21 feet and powered by 40- or 50-horsepower outboards. The skiffs were almost always painted a dead gray, because of the belief that gray is very tough to see at night. Commercial setnetting in Bristol Bay was not always productive, and some fishermen made a little extra cash with night-time expeditions over the boundary lines. Fish and Game enforcement had a tough time spotting the dark-colored poachers, plus it was almost impossible to tell the skiffs apart. One law-abiding family that fished a half-dozen Seymours painted their skiffs a bright yellow to separate their clean operation from some of the more suspect ones. However, it transpired that they sold a skiff to a well-known fisherman with a bit of a shady reputation. One day, prior to a fishery opening, the miscreant used his new yellow skiff to bring a good load of salmon from above the line. He was not caught, but the family that sold him the skiff was chagrined to think that other fishermen, seeing the yellow skiff, would think they were engaging in illegal fishing. The next day, while the outlaw had his skiff parked on the beach and was safely out of sight at the neighborhood pub, one of the family's boys hurried down and put a good coat of gray paint over the bright yellow skiff. Times have changed in Bristol Bay, and nowhere is the changing of the guard more noticeable than in the boat yard. Aluminum gillnetters are the rule. Fiberglass is becoming scarce and there are few, if any, working wood vessels. Setnet skiffs have undergone an even more dramatic evolution. Formerly, most setnet boats were powered with 25- and 35-horsepower, two-cycle engines. Today's beach fishermen power their skiffs with big four-strokes well over 70 horsepower. There may only be one or two working wood skiffs left in Bristol Bay. The same can be said for vessels in the drift fleet. The day is not far off when fiberglass vessels will also be gone as younger, aggressive permit-holders replace the old guard. Times change and the wheel spins. We are continually re-inventing it. Big, for the sake of bigger, is not always better. Care and quality should always take precedence over faster. The new wave of vessels in the Bristol Bay fishery is not a bad thing, as long as it is tempered with inventiveness and thoughtfulness. 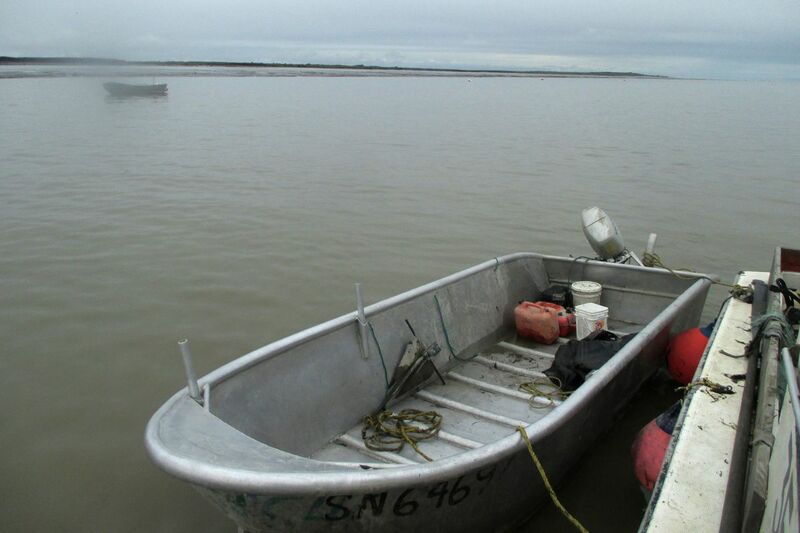 The Bristol Bay fishery is in the midst of a dramatic change. Fish quality is the paramount concern. Drift vessels must be large enough to have refrigeration on board so as to keep their catch cold. That is not the case for the setnet fleet. Shorter delivery times from net to tender may be the best answer, and that means small, quick skiffs. Time will be the judge of where we go from here. John Schandelmeier is a lifelong Alaskan who lives near Paxson with his family. He is a two-time Yukon Quest champion and a Bristol Bay commercial fisherman.